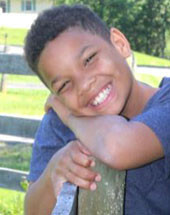 Elijah is an active young boy that likes to explore the world. He enjoys playing outside, creating masterpieces with Legos, drawing and singing. Elijah has expressed a desire to be on television in a singing competition to show the world his talent! He also loves to share with everyone what a great swimmer he is and enjoys any chance that he can show that skill off! Elijah is working on broadening his interests. He is currently learning how to fish at a nearby pond and working with horses. Elijah would like a forever family to encourage him through his difficult school subjects and celebrate with him in his successes. He enjoys the company of others and is often very talkative, sharing what he likes, his aspirations and things he would like to try. He likes to play card games and is eager to teach others some of his favorite games. Elijah is excited about finding his forever family!